An easy Time Saver to make ahead for busy nights. Once you learn how to boil chicken you'll be able to take advantage of sales and keep your freezer stocked. This is a simple way to cook a lot of chicken and you get a bonus, homemade chicken broth you can use in other dishes. Boiled chicken can be sliced and frozen for super quick meals on your busiest nights. That's the essence of what I call "Time Savers." You make more than you need while you're cooking because adding a few extra pieces doesn't take much time at all compared to repeating the whole process. 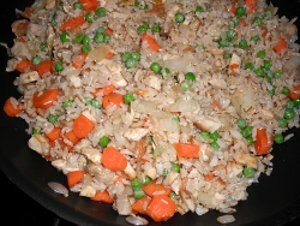 Those time-saving pre cooked chicken slices can go in the freezer and you can use them in all sorts of dishes later, like Chicken Fried Rice. Put the chicken in a large stock pot and cover it with cold water. You can cook it whole or in pieces, with or without bones. Tip: A whole chicken will take the longest to finish cooking. Boneless meat will cook faster too, but the bones are great for flavoring the broth. And since you can freeze the broth it's worth the extra time. When I’m cooking ahead I don’t add a lot of seasoning at this point so that the flavor is still neutral enough that I can add the cooked meat to any dish I want from Mexician to Italian to Chinese to an Indian curry. That way I get the most versitility out of my Time Saver. Quick Tip:If you wrap all the veggies and herbs in cheese cloth, including peppercorns instead of crushed pepper you can keep the broth clearer. Bring the water to a boil so it’s nice and hot and the chicken starts cooking then reduce the heat so the pot just simmers. Little bubbles should rise but no huge bubbles. Let the pot simmer until the chicken is done, about half hour to an hour and a quarter depending on the size of the pieces. You can look up more exact chicken cooking times, using the simmering time recommendations if you need a guideline to follow. Start counting the cooking time when the water boils and you turn the pot down to a simmer. There might be "scum," white foamy frothy stuff that rises to the surface as the meat cooks, just skim it with a spoon and throw it away. When the chicken is done take it out of the pot to cool. Taste the broth and season it however you like. If you want a stronger flavor let it simmer and reduce (evaporate) until you're happy with it. Salt to taste after your broth is reduced. Drain the broth into a bowl and put the cooked chicken and the broth in the fridge to cool for a bit or season and serve. Throw out the cooked veggies, they'll be soft and bland anyway. Once it's cooled, that extra chicken and all the broth can be frozen. MYTH: Chicken must be thawed before cooking. FACT: Chicken can be cooked from frozen. 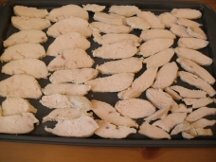 It will take about 50% longer than thawed chicken and you must use a fast cooking method. Cooking it in the oven or on the stove is OK according to the USDA (under the Safe Defrosting headline) so boil and simmer away. However, I recommend thawing if you're going to cook a whole bird so it doesn't get over-cooked in the less thick areas. Slice up your chicken before freezing. The slices are easy to use in other dishes and easy to chop smaller if you need too. 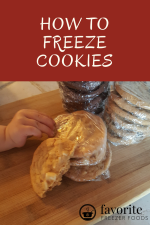 Place the slices so they are in a single layer on a cookie sheet and put them in the freezer an hour or two until they are frozen solid. This method is called flash freezing. 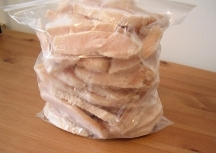 Once solid put the slices in a freezer bag, label, date and add to your freezer inventory sheet. Freeze the broth in rigid plastic containers for single serving, family meal or soup size quantities. 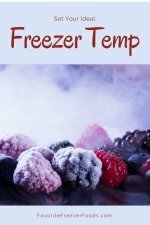 You can also put it in freezer bags in one or two cup quantities and use it to flavor dishes in place of water when cooking grains like rice and couscous. Another great way to freeze broth is in ice cube trays to add just a bit of flavor to a dish or sauté veggies in place of butter or oil. Again, label, date and add it to your freezer inventory sheet. Thawing depends on the dish since the chicken is already cooked and over cooking can cause the meat to dry out. For a soup, casserole, calzone or other dish that will be cooked don't thaw first, use it frozen. For a meal that won’t be cooked, like a fresh green salad, thaw in the meat in the fridge the night before or heat just until warm enough in the microwave. If you want a golden brown color sauté the chicken a few minutes before adding to your dish. Return from How to Boil Chicken to the homepage of Favorite Freezer Foods.